With the immense help of my mother-and sister-in-law (Nana and Aunt Ali), Tom and I have recently begun attempting a major overhaul of the disorganized insanity that is our home. Our champions arrived yesterday evening, armed with shelves, containers, activities for the kids, and indomitable spirits. Of course, as I began to realize yesterday while attempting some pre-cleaning in anticipation of their coming, I'm so out-of-shape and lacking in energy that very little intense exertion now causes my leg muscles to shake and my limbs to tire. The resulting soreness plagued me through the day today, especially as I worked to counter the worst of Mia's teething meltdowns with carrying, rocking, wearing, and otherwise interacting in a highly physical manner. Perhaps worst of all, however, was the massive allergy attack that came on as soon as we began shifting objects from their too-long stagnant dusty locations and rearranging them in more efficient ways. I think I mentally and physically checked out a couple of hours into the whole mess, miserable as I began to feel, though I still tried to respond to necessary tasks when prompted. Mia's prompts could not- of course- really be ignored. So we come to now, at the end of a high-activity day, hours after I first began fighting with my laptop to get it to read the SD card from my camera and failing (thank you, useless Windows 8 update), days after finally putting an end to the week-long panic I suffered when I tried out Flickr's "New Photo Experience," only to discover that I could no longer edit or capture the URL locations of my pictures (opting out of said "experience" finally made things all better), and weeks after first starting to feel like I'm running short on ideas and long on irrecuperable fatigue, and I'm inches from throwing in the towel on this blogging thing altogether. I have nothing much useful to say most days. I have very few good pictures to share. However, I can- at least- supply a bit of self-deprecating humor tonight. 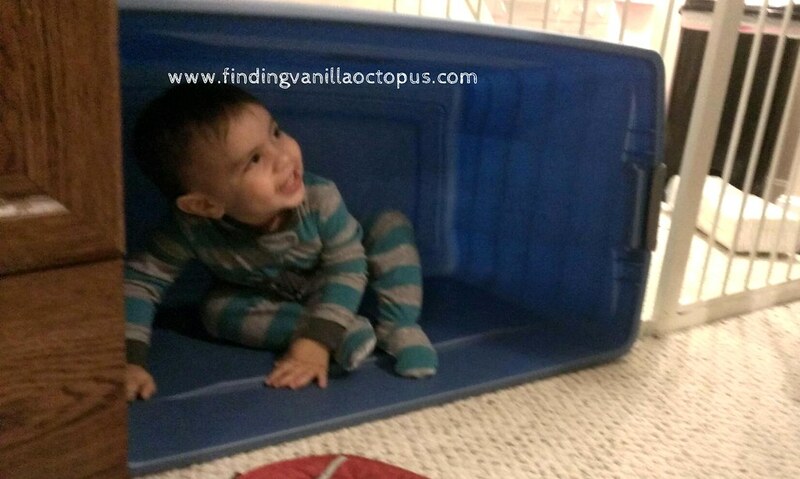 You see, rich as we are in bins and storage containers at the moment, I felt the need to indulge my favorite little boy this evening after watching him spend all day trying to invade every container we attempted to put to actual use and being summarily denied each time. I turned a huge empty bin on its side and let him go crazy with it. 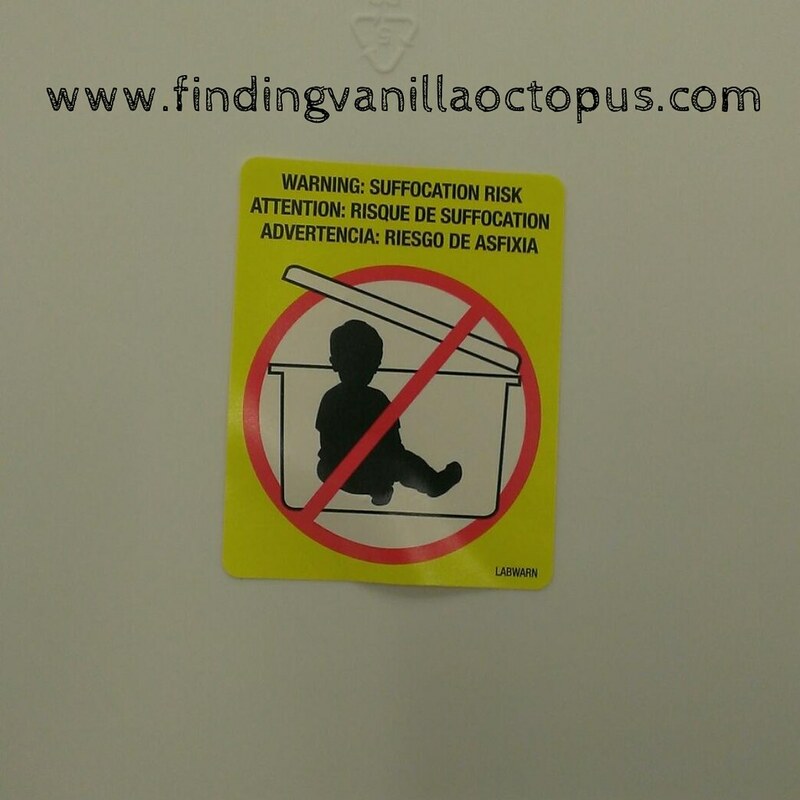 A couple of hours later, as he was out on a shopping trip with his mother for (you guessed it) more bins, Tom snapped a shot of a warning label he noticed stuck on the side of one of the many options that he was considering. Yeah. I guess we're like, the worst parents ever. So, Folks, better not try that at home. To our credit, we had the bin turned over and the lid was not in reach. And did you see the smile on my little man? 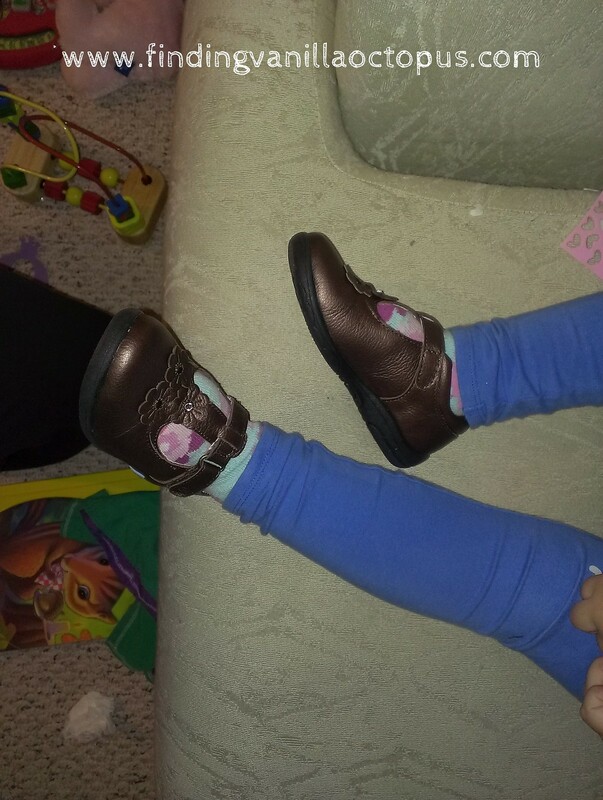 Someone got new shoes today. Forgive the randomness; I think my last functioning brain cell just went into sleep mode for the night.